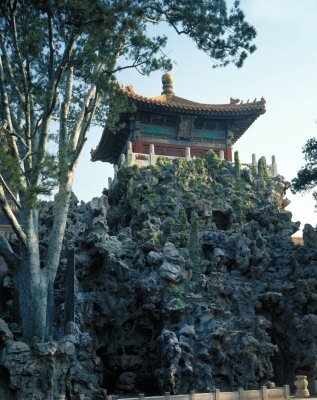 The Mountain of Accumulated Excellence (Duixiu shan) is a man-made stone hill, situated in the north part of the Imperial Garden. The site was originally the location of the Hall for Enjoying Flowers, until Emperor Wanli (r. 1573-1620) commissioned the construction of an artificial hill in the late sixteenth century.The hill is about ten meters high and has a steep path winding to the top. A plaque hung in the center of the cave door is inscribed with "Accumulated Elegance". On top of the hill is the Imperial Prospect Pavilion. In front of the hill there is a beast that spurts a column of water almost as high as the mountain itself. It is the only fountain survived in the imperial palace.